An LS1 Holden Monaro packing twin turbochargers and around 390kW at the treads - and that's after being detuned! The battlelines were drawn back in the ‘80s - traditional V8 muscle up against smaller capacity turbo engines. 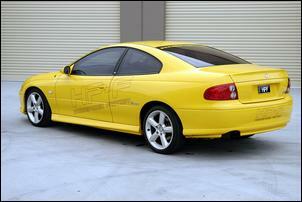 But the Amberley Autos/Horsepower Factory Holden Monaro rewrites the rules of combat. You see, this monster packs 5.7 litres of bent-eight beef combined with the force of twin turbochargers! Rob Vickery from Amberley Autos explains that LS1 supercharging has been done to death and, while you can achieve good results, the twin turbo set-up has numerous advantages. “With turbochargers you can easily alter how much boost you get at certain revs and the turbos tend to work well across the entire range,” he says. 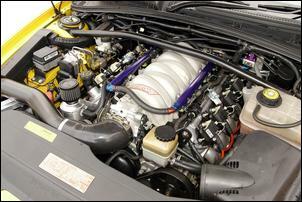 The Monaro seen here is the test bed for Amberley Autos' newly released LS1 twin turbo kits. There are currently two configurations on offer – Stage One and Stage Two. Stage One gives 8 – 9 psi boost for around 350 – 370kW at the wheels and retails for AUD$16,000. Rob says it’s quite a detailed conversion that involves dropping the front K-frame and a lot of fiddling with clearances. Stage Two brings larger turbochargers and dump pipes, a bigger intercooler and a fuel system set-up to suit power requirements. The Stage Two is typically matched with an engine that’s received a performance rebuild. Cost is generally around AUD$20,000. 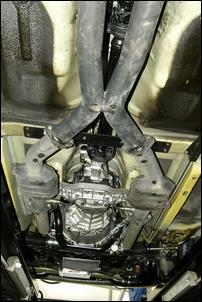 The Stage One turbo kit, as currently fitted to the demo Monaro, comprises tubular exhaust manifolds that are fabricated from thick wall tube (aka steam pipe). 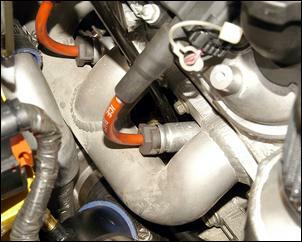 Interestingly, a cross-over pipe is used to join the manifolds; the intention is to equalise exhaust pressure. Rob says they’ve avoided the need for heat shields by treating the manifolds to a high-temperature ceramic coating. At the time of photography, a pair of relatively small Garrett GT25R ball-bearing turbochargers was fitted to the Monaro. These give excellent boost response and a very useable torque curve. Rob says the turbochargers are mounted close to the engine for fast spool-up and high enough that an electric scavenging oil pump isn’t required. The oil for the turbos comes from a passage near the oil filter and is returned via a pair of fittings in the rear of the sump. 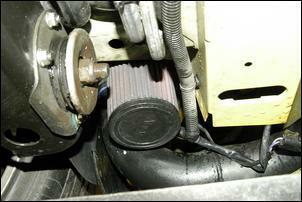 The heater hoses provide the pick-up and return for cooling water. The turbo compressors are protected by a pair of K&N pod filters which are tucked deep in the engine bay - about the only place they’d fit. Amberley Autos has left the standard airbox under the bonnet to give a factory appearance - but the inside of the airbox has become home for the ECU. With boost pressure currently set to a maximum of 10 psi (using a TurboSmart bleed valve), charge-air temperatures are chilled by a bar-and-plate intercooler produced by HyperFlow. 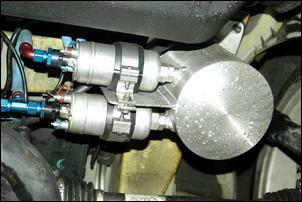 A pair of OE-style Bosch blow-off valves is fitted. 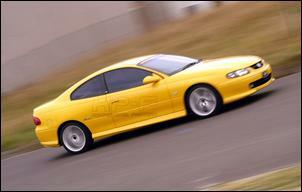 As part of its development, the Amberley Autos Monaro has also been treated to a top-end rebuild. The engine boasts Higgins Race heads, a performance cam, stainless valves, aftermarket valve springs, Crow retainers and a Rollmaster timing chain. The bottom-end remains untouched. 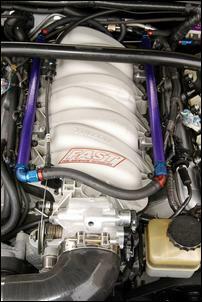 A Fast intake manifold and 94mm Starr throttle body further enhance breathing. To help maintain reliability when exploring the limits of the twin turbo package, Amberley Autos installed a custom 10 litre sump, remote oil filter and oil cooler. 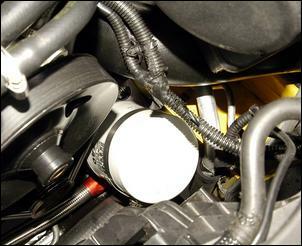 An oil catch can is also fitted. Keeping up with the fuel requirement of this engine is a surge tank feeding a pair of Bosch Motorsport pumps. There’s also a Wilson fuel rail, 42lb injectors and a SX regulator (with a return line). Ignition is stock. Controlling the whole shebang is the standard engine management reprogrammed using Flash Scan software. A MAP load input is employed. With 98 RON fuel in the tank and a street-trim twin 3 inch exhaust, the Amberley Autos Monaro has ripped out around 390kW at the wheels in its current guise. Peak power is reached between 5800 and 6000 rpm. But amazingly, Rob has seen the Monaro blast out 500kW at the wheels when running bigger turbos, more boost, bigger injectors and race fuel. With a tricked Turbo 400 transmission, line locker, drag-tuned suspension, roll cage and harnesses, the car was able to run an astounding 9.83 second ET! Rob says no one else in the country has run a 9 second pass with the standard Holden independent rear (which loves to squat and burn the inside edge of the tyres). With the smaller turbos reinstalled and the wick turned down to ‘just’ 390kW ATW, the car now uses a stock T5 6-speed gearbox teamed with a HP-F optional clutch upgrade, chrome-moly flywheel and stock 3.46:1 LSD. The T5 ‘box is fine for street use but is marginal in a drag racing application. Rob tells us he has now twin turbocharged about 15 LS1s around the country – and each one of these cars has performed faultlessly. The demo Monaro has racked up 46,000km (about 15,000km with the turbos) without even a whiff of a problem. And Rob still gets a huge buzz from the awesome turbo-fed acceleration. The fact that the car also returns better than standard fuel consumption is a bonus (Rob has recorded 8.5 litres per 100km in the Monaro on an interstate trip). Performance and economy from a big cube V8? The age-old war looks like hotting up!